I wanted you to know that I’ll be offering a daylong workshop on February 24th at Circles of Wisdom in Methuen, MA called Midlife Magic: Discover What Really Matters at Midlife. Grab a friend and join us for the day! You can learn more about it, here. Also, if you live in Turkey or Korea, please email Lisa@CherylRichardson.com for a chance to receive a copy of one of my books printed in your language. Last year I joined a local Facebook group in our small town. Members of this group share local news, offer referrals for home repairs, help find lost pets, and make requests for support. Recently, a woman posted a notice looking for someone to shovel her walkway and stairs after a snowstorm. She and her husband had both hurt their backs, and she hoped to find a teenager who wanted to earn some extra money. When I saw this exchange I, too, felt grateful for our little community and the way in which strangers reach out to support one another. These are the stories that make me feel good and offer hope for our future when so much of life seems filled with pain and suffering and drama. The Facebook post reminded me of something my husband, Michael, said during a retreat last year. A woman in the audience mentioned her anxiety about the state of the world and the trouble she had dealing with people who didn’t share her views. I smiled at the wisdom in his question. When I look for it, I see evidence of this selfless, essential nature all the time. Just yesterday I came upon a woman whose car slid off the road and I watched strangers pull over and run to help. It feels good and natural for most of us to be there for someone in need. So, this week, in the spirit of Valentine’s Day, let’s be on the lookout for ways to offer support. You can start with your local community. Love a neighbor and shovel a walkway. Love a cause that matters to you and donate what you can afford. Love the earth and plant a tree. Or love an animal and rescue one from a nearby shelter . PS – The registrations are coming in for our next “Self Care by the Sea” retreat with Russ Hudson, author of The Wisdom of the Enneagram, scheduled the weekend of April 12th-14th. You can learn more and register, here. PPS – This week’s Facebook Live will be held on Wednesday at 6pm EST/3pm PST. 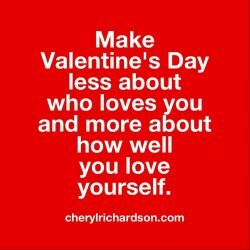 You can watch past sessions on my YouTube channel at CherylRichardsonTV here.